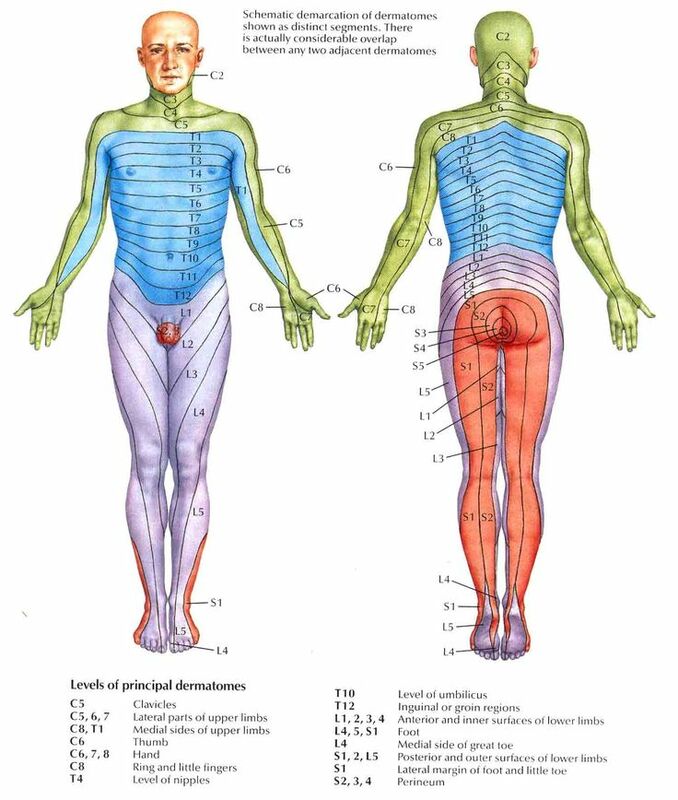 Referred pain is pain perceived at a location other than the site of the painful stimulus. It usually originates in one of the visceral organs but is felt in the skin or sometimes in another area deep inside the body. Its mechanism is likely due to the fact that pain signals from the viscera travel along the same neural pathways used by pain signals from the skin. The result is the perception of pain originating in the skin rather than in a deep-seated visceral organ or neural structure. Visceral nociceptors project into the spinal cord via small diameter myelinated and unmyelinated fibres from the autonomic nervous system. They go on to synapse close to the point of embryonic origin in the spine. When an organ develops pain, it can therefore be perceived as being at a different point in the body, on the surface, rather than in the organ itself. Hyperalgesia is defined as "An increased sensitivity to pain, which may be caused by damage to nociceptors or peripheral nerves". It is divided into 2 types, primary and secondary. 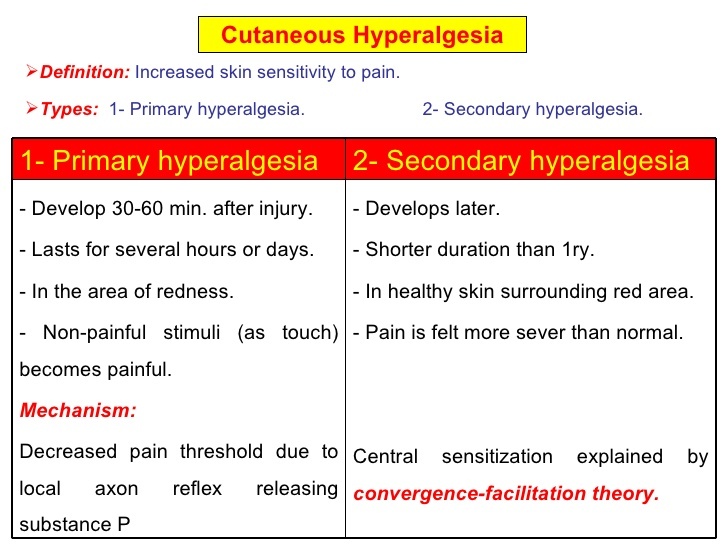 Primary hyperalgesia - pain and sensitivity in the damaged tissues. Secondary hyperalgesia - pain and sensitivity that occurs in area around the damaged tissues. Substance P appears to have a significant role in the sensitiation of nociceptors, which may explain the heightened feeling of pain in injured tissue (primary hyperalgesia). Although this doesn't account for the perception of non-painful stimuli as painful. Secondary hyperalgesia is most likely accounted for by changes in the dorsal horn which affect the processing of sensory information. It is likely that normally silent nociceptors are recruited, and sprouting of large diameter sensory afferent occurs projecting into the dorsal horn laminae. Central pain sensitization (increased response of neurons) following painful, often repetitive, stimulation. Allodynia can lead to the triggering of a pain response from stimuli which do not normally provoke pain. Movement allodynia - pain triggered by normal movement of joints or muscles. ↑ 1.0 1.1 Roger, Barker, Barasi, Neal. Neuroscience at a glance.1999 Blackwell science. ↑ Hart BL (1988). "Biological basis of the behavior of sick animals". Neurosci Biobehav Rev 12 (2): 123–37. ↑ LoPinto C, Young WB, Ashkenazi A (2006). "Comparison of dynamic (brush) and static (pressure) mechanical allodynia in migraine". Cephalalgia 26 (7): 852–6.